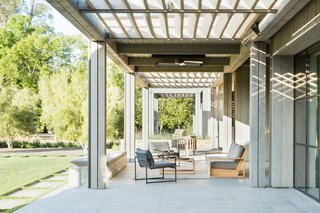 Wade Design Architects and Geremia Design create an ethereal indoor/outdoor dream home that embraces California Wine Country's lush environs. 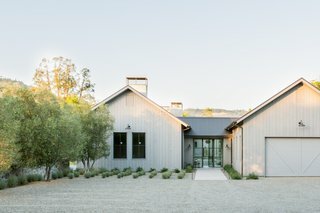 Frequent visits to Calistoga Ranch left a Los Angeles couple hankering for even more time amid Napa Valley’s tranquil vineyards, so they realized it was the right moment to build their post-retirement dream home in California Wine Country. Wade Design Architects and Geremia Design knew exactly how to bring it to life. To ensure continuity, the middle portion of the terrace—including integrated heaters, a ceiling fan, and a fire pit—is covered with a minimal slope roof that Wade Design Architects cleverly hid above a continuous line of structural beams. 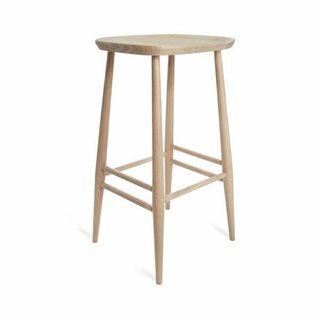 Teak furniture, sourced from Teak Warehouse, adds a fitting lightness to the patio. 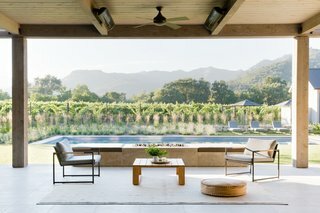 Both husband and wife had an affinity for the rustic yet sophisticated indoor/outdoor architecture of Constant Diamond Mountain Vineyard in Calistoga, which inspired the design of their own new residence in the same small city. At just under 9,000 square feet, the low-slung complex encompasses a two-bedroom home, three-bedroom guest house, pool house, and car barn containing the husband’s beloved reserve of automobiles and motorcycles. Situated on an east-west axis, they all open north to maximize mighty sight lines. The pool house patio, featuring Harbour Outdoor sun loungers. "A desire for seamless transitions between the outdoors and living spaces was top of mind, as well as walls of glass that framed the natural views as art," explains Luke Wade, principal at San Anselmo, California–based Wade Design Architects. "The property abuts a vineyard with mountains beyond, and the buildings were arranged to focus on this while also forming courts and yards between the structures." A sculptural bench from the Future Perfect and a circa-1950s vintage blown-glass, brass, and enameled metal Kalmar Tulipan chandelier invite guests through the entry. The space flows into the kitchen, where meals unfold on a built-in banquette upholstered in SH Frank leather by Geremia Design, or CH33T chairs underneath an Atelier Rich Tegelaar Open Meshmatics pendant. It's 5:00 somewhere. 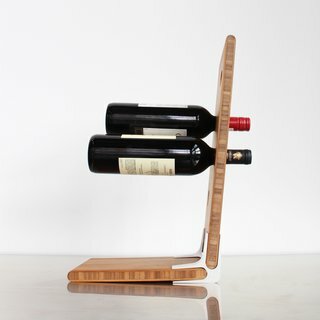 The Wine Rack displays 5 bottles with a modest countertop footprint. Ships flat. Assembles easily. No tools needed. Catnap crossing. 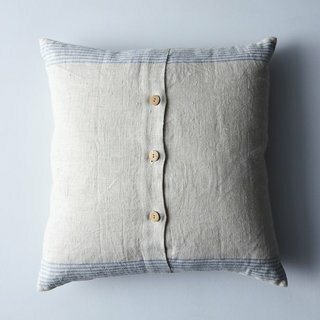 Naptime just got a little dreamier with this slubby beige linen pillow with cheerful blue stripes and button closures, inspired by vintage farm textiles. Perch one on your couch, bed, or a windowside bench for breezy, farmhouse vibes. 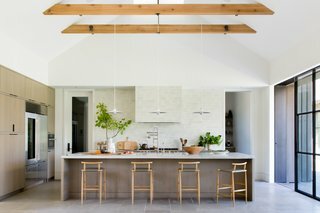 Brendan Ravenhill Studio Grain pendants and Graye leather-and-oak counter stools make the kitchen feel bright and contemporary. Aside from the loft devoted to yoga and Pilates above the car barn, the home was intentionally built at just one level "to connect to the earth," Wade points out. The centerpiece is the vast kitchen, living, and dining area, which pours onto the terrace overlooking the lawn, pool, and vineyards. 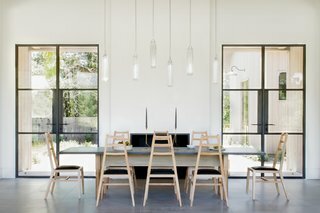 In the dining room of the main house, guests perch on black leather and bleached white oak Stahl and Band chairs around Jeff Martin Joinery’s Schoolhouse table fashioned from ebonized oak and bleached and whitewashed ash. Tom Kirk Flute pendants hang overhead. 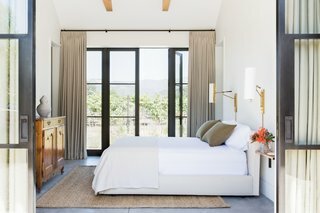 Fresh air flowing from room to room with ease was important to Lauren Geremia, founder and principal at San Francisco–based Geremia Design, who opted for an earthy palette and light but durable materials. Along with antiques, the design team sourced many of the pieces throughout the home from Los Angeles showrooms and boutiques like Nickey Kehoe, Blackman Cruz, Thomas Hayes Studio, JF Chen, and for bedding and accessories, Garde. Here, a guest house bedroom directly opens onto nature. "The pastoral setting informed our design choices, and because this is a forever home, every last detail was considered and deliberate—from outlets that were hand painted to disappear into counters, to the radiant-heated floors that run inside to out. 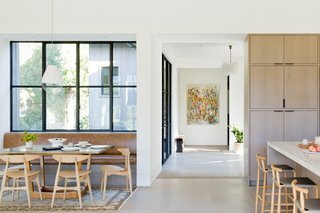 The end result is a home that is serene, forward-thinking, and highly livable," she says. The master bathroom is one of Geremia’s favorite rooms. "It’s focused on ritual and relaxation—a special place to start and end the day," she says. "You can watch the neighboring horses graze from the outdoor shower. Above the sink in the master bath, a Trapeze 10 pendant crafted from oil-rubbed bronze and porcelain is one of the highlights. The home is filled with 19th- and 20th-century European antiques from the couple’s own collection—"they came to the project with case pieces that fit perfectly with the aesthetic," points out Geremia. These pieces play well with modern accents like metal-shaded light fixtures with a faint wood grain from Los Angeles-based Brendan Ravenhill Studio’s "Grain" family. 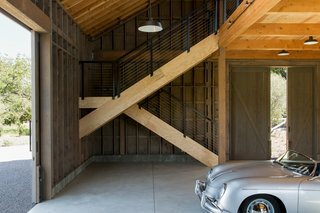 The bi-level car barn, a spare, timber-clad structure with an A-frame roof, nods to traditional farmhouses, but is "sleek and contemporary in spirit," says Geremia. Inspired by an old photo of a porcelain farmhouse sink, it features polished concrete floors. Says Geremia, "Like so much in the home, it’s small details and sometimes imperceptible gestures that create the exquisite." 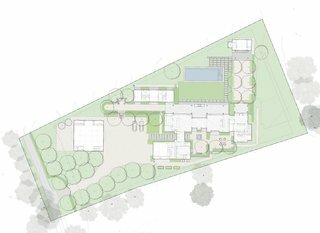 The site plan for the Calistoga compound.